I spent Christmas and new years in Japan for the first time this year. Both were celebrated completely differently from back home. Christmas in Japan is, similar to another valentine’s day, a day for couples. And it is normal to go on a date with your partner, often to see the illuminations (fantastic displays made of lights). In the U.K. the first thing to come to mind about Christmas is usually the food or the presents. There is a slight trend of exchanging gifts in Japan too. My host family’s kids both got 2 or 3. And it seems like couples also exchange gifts. But, unlike the U.K. it is not the most expensive time for adults. The food is also similar but slightly different. 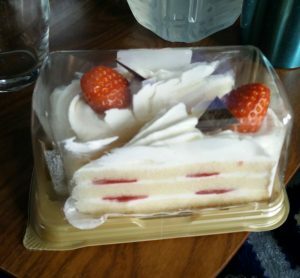 For example, rather than the heavy, alcohol soaked fruit cake we have, the Japanese Christmas cake is a light, cream smothered strawberry sponge cake. Or instead of roast turkey, it is common to eat KFC (Kentucky Fried Chicken).There are special Christmas barrels, an online pre-order system, and even queues to buy it. This is due to the astounding success of a KFC advert that ran in the 70’s, so that now in Japan Christmas equals KFC. It is likely that staying up till midnight on 31st December to welcome the New Year is something that can be found anywhere. Certainly it is so in Japan and the U.K. While waiting for the new year, it seems that watching Kōhaku Uta Gassen or Downtown no Gaki no Tsukai ya Arahende! is common. We mainly watched Downtown no Gaki no Tsukai ya Arahende!, which is a try not to laugh (lit. it’s forbidden to laugh) style program, and in the advert breaks we saw bits of Kōhaku Uta Gassen, a music show, and Sasuke (ninja warrior). The “it’s forbidden to laugh” program was really funny, but it was also unbelievably weird. There were 5 comedians as the main characters, and if one of them laughed then a ninja would come running and whack them. In order to make them laugh, various famous people came, and lots of strange things happened. For example, electric shock tug of war, skits, cosplay, a guy eating eggs while submerged in water, etc. etc. 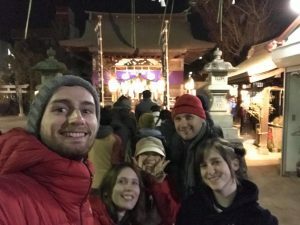 When it struck midnight, we all wished each other “Happy new year” and a rather untranslatable Japanese term (yoroshiku) meaning something similar to a wish for continuing our relationships. Then went to a shrine to do Hatsumōde. Hatsumōde is the Japanese term for the first visit to a shrine or temple of the year. We went to a small shrine near the house, but even so there was people lining up outside, so we had to wait. After praying we received a small token as a memorial of having done it, slightly resembling a good luck charm, with a small bell attached. As well as a drink, 2 oranges and some sake. From the 1st of January till around the 3rd Fukubukuro (or lucky bags) are sold in Japan. A fukubukuro from a clothes shop will usually go for upwards of 8000 yen, but will have 30000 yen (or more) worth of stuff inside. So, if you like the stuff inside, it is a really good deal. However, until you buy the bag you have no idea what is inside. I bought a fukubukuro from a clothes brand called WEGO. I was pretty lucky and mostly got stuff I liked. And the two small bags that didn’t really work for me I gave to my host family’s kids. Because one of them caught the eye of the 4-year-old. Which he then, super cutely, took with him everywhere over new years. In Japan adults spend more money at new years than at Christmas. This is due to the custom of giving Otoshidama (New Year money) to children. When meeting kids around new years, family or friends of the parents will give money in a special envelope to them. 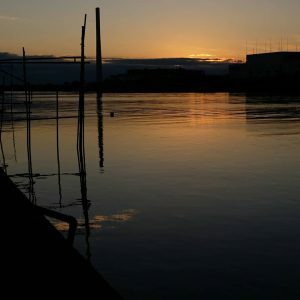 It seems like it is normal to put 1000 yen (or more) in one envelope, so if your family (or parents friends network) is large (or generous), a child will received a considerable sum, so it is looked forward to every year. There is also special food for new years in Japan. 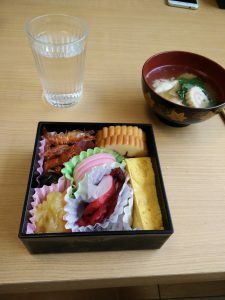 Osechi. I asked around my friends and there were some that had never eaten osechi, or only had a little of it. But it is traditional to eat it on the first of January. Osechi is comprised of lots of different foods, which all have meanings. I don’t know very much about it but, the ones I’ve heard were all to do with long life. And there are many healthy foods. Including octopus, eggs, black beans, prawns. We also had a kind of soup with mochi in it. All of it was delicious! And the fact that they have meanings interests me, I would like to find out more about it.